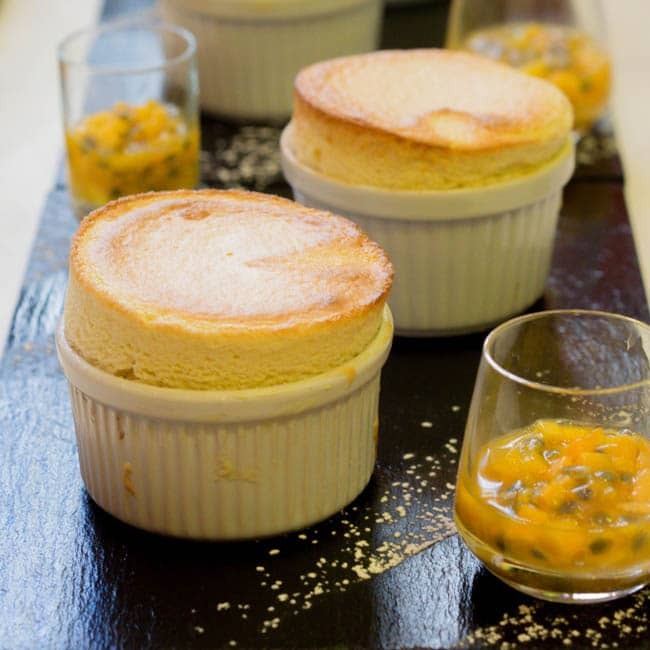 A soft, light and airy dessert – Passion fruit and Banana Souffle. Simply delicious. I hadn’t until I made it myself at a French dessert cooking class in Paris but I always heard a lot about it. There’s this air of intrigue and mystery with the souffle. Will it rise? What if it falls? Will it have that perfect soft lightly gooey yet not raw consistency inside? I’ve always seen it shown in movies with the souffle maker rushing into the kitchen in the nick of time have perfect intuition about when that souffle is finally ready. One scene I can think of is with Mandy Moore in Because I Said So – one of those standard rom coms. I always backed away from making a souffle at home. It just seemed too intimidating and fear inducing to be making all on my own. So it worked out perfectly that I got to make the souffle in a group with a real pro showing us how to do it. It’s actually not so scary after all. A bit of technique to it that’s all. Though the whole cooking group did hold their breath as the souffle was being taken out of the oven. The result though? A souffle that had risen perfectly and was light airy and delicious after that first bite. If you love banana or passion fruit, then you’ll love this Passionfruit and Banana Souffle. 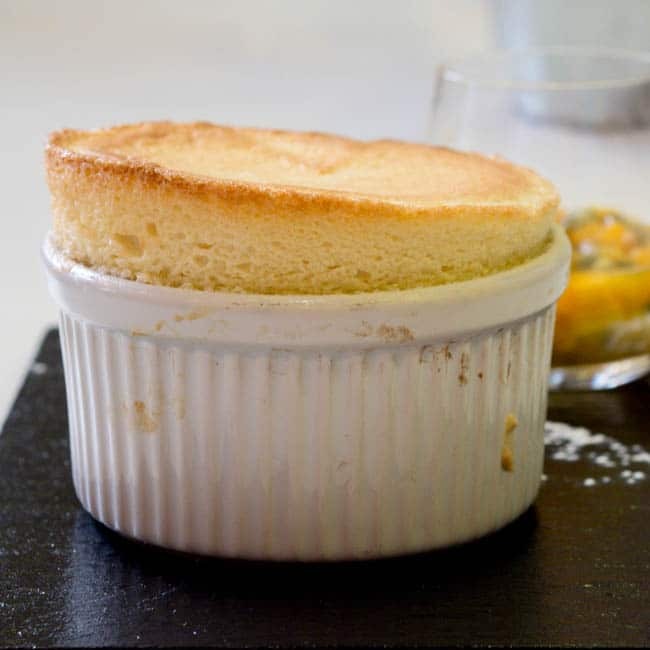 It uses a whole load of passionfruits and just 1 banana but the balance of flavors and the soft texture of the souffle will just blow you away. You have to try it. If passionfruit’s in season and you can buy them at a great price from your local grocer’s, get at least 10 of them for this amazing passionfruit and banana souffle recipe. You won’t regret it. What about you? Have you tackled your banana souffle making fears and given it a shot? After the passionfruit and banana souffle I was treated to an even more incredible array of flavors in a deconstructed lemon meringue pie. YUM! A super delighful fluffy and soft banana souffle with passion fruit. A classic French recipe with a twist! and extra sugar for moulds. To make the pastry cream, bring 120 ml of the milk, the cream and sugar to a gentle simmer, and in a separate bowl whisk the egg yolks with the other 30ml of the milk, sift the flours into the mixture and whisk to form a smooth paste. When the milk and cream has reached a gentle simmer, pour it gently into the eggs to bring the temperature of the eggs up little by little, whisking as you go. Put the pan back onto the heat and continue whisking as you go, until the pastry cream thickens. Cook it for around 5 minutes so the flour flavor cooks off. You should end up with a thickish, smooth sauce. Chill until you need it. mold and turn it around, tipping the mold so the sugar covers the inside completely, do this over a dish to catch any that falls out. Pour the excess into the next mold and repeat until you have covered all of them. Chill the molds until you need them. Scrape the passion fruit seeds and pulp into a sieve and rub the pulp and juice through leaving the seeds behind. Add the mashed banana and mix it in well. This will make the base flavor so it should be quite strong. mixing until you have a thick shiny meringue. Put the pastry cream in a bowl, add the passion fruit mixture and whisk everything together. Add 1/3 of the egg white to start with and beat it in well with a whisk. This will ensure that the flavors are evenly distributed and loosen up the mix enabling you to fold in the remaining meringue. The mixture should be smooth and have no lumps. It is normal to loose some volume at this stage. Keep beating until the mixture is quite smooth and there are no lumps. Gently fold in the remaining egg white. mixture from the dish, this will stop the soufflé flopping over the edge of the dish as it rises. The soufflés can be stored in the fridge for 1- 1 1/2 hours before being baked. Pre heat the oven to 390 F. Put the soufflés on a baking sheet in the middle of the oven to cook for 15-20 minutes or until they rise. Don't open the oven door completely; you can have a little look but keep the temperature even. 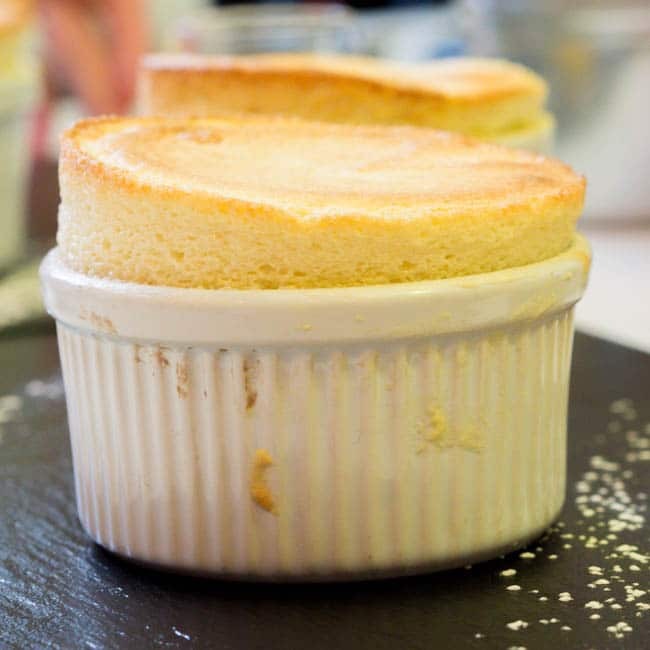 As long as the soufflés are cooked properly they won't sink straight away, give them a shake to make sure they are not too wobbly and check that the top looks cooked. Dust with icing sugar straight away and serve, accompanied by a Small glass of cubed mango and passion fruit pulp. Have always wanted to make this.